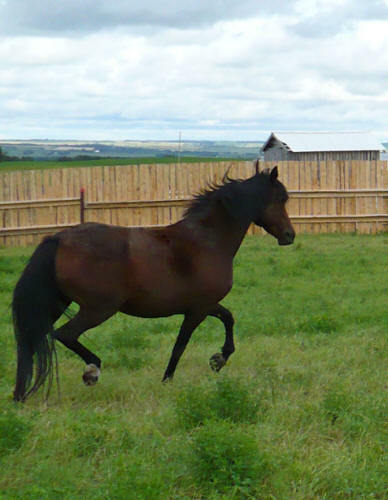 April is a tall, dishy faced very pretty mare with good bone and exceptional sport movement, having lots of drive off the rear. Everyone who sees her simply falls in love with her, in fact my new farrier commented that "This is what all horses should be built like, what all breeders should strive to produce". In the summer of '06 she was started under saddle and the trainer couldn't believe how kind hearted she was stating "not a bad bone in her body", he had his 6 yr old daughter sitting on her the second time she was ridden! She has been ridden on the road, moved cattle at the feedlot and I believe she's been roped off at the feedlot. 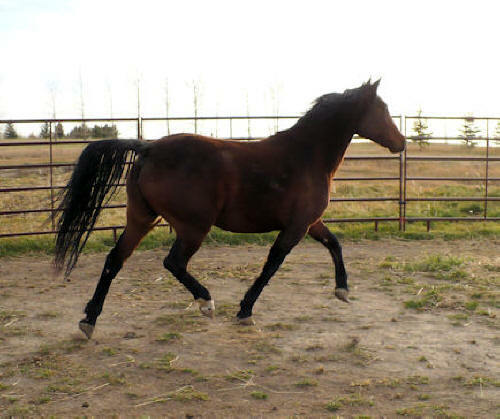 Although she will need a refresher under saddle, she is very sharp and it won't take long for her to get all back. 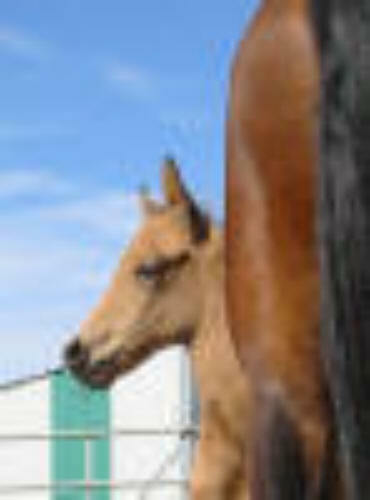 She gave me a stunning buckskin colt in 2007 (see Sailor on our Youngsters page) and in May of 2008, she produced another superb sport horse prospect, a Smokey black colt (see Charlie' on our Youngsters page - sold), and a spectacular bay colt by Intrigue in 2010. 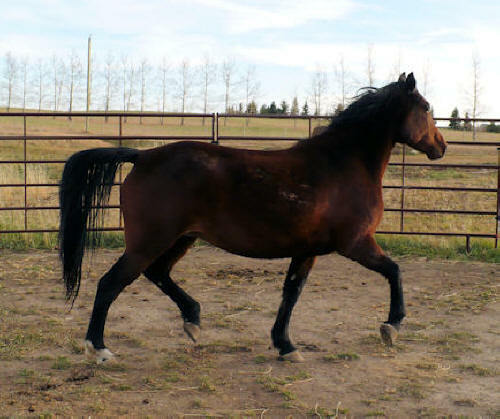 This mare throws size, pretty, and good temperaments regardless of who who she is bred too! 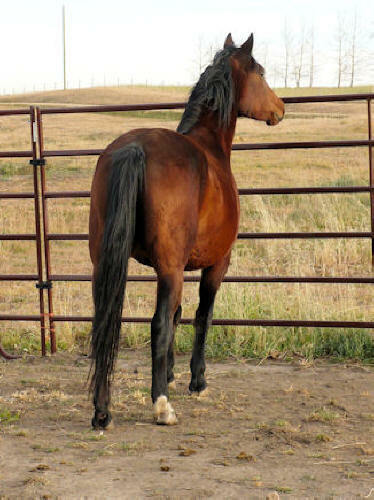 April is FOR SALE: April is ONLY being offered for sale due to upcoming divorce, as in many ways she is my best producing mare. However due to divorce I have to reduce numbers and I'm hoping to keep her 07 foal as a future herd sire, so her lines, structure, movement & class will continue in my herd! 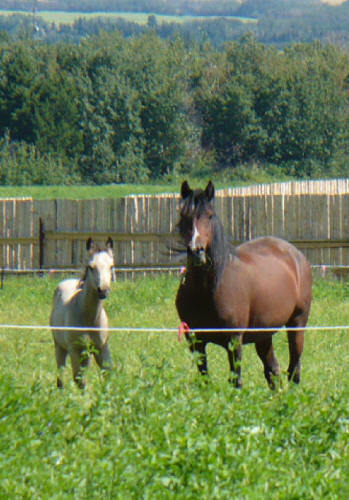 To see the quality of foals that April produces, see her colts under the "Our Produce" page. Click here to see Aprils' extended pedigree.